Wikileaks is, of course, referring to the ongoing massive dump of documents heisted from Hillary Clinton campaign chair John Podesta’s email account — proving Assange’s intent to deliver transparency in his October Surprise in the remaining days before Americans vote in one of the most contentious presidential elections in U.S. history. Speculation and accusation immediately ensued — in particular, theories positing the United States government had followed through on a ludicrous public vow to retaliate against Russia with a somehow covert cyber attack — either directly or through manipulation of officials in the Ecuadorian embassy-turned-asylum where Assange has resided for years. In the context of tweets prior to that about Assange’s riven internet connection — which proffered what appeared to be encryption keys headed sequentially with each of three “pre-commitment[s]” on “John Kerry,” “Ecuador,” and “UK FCO” — that announcement further fueled speculation without offering proof. In fact, The Free Thought Project found the timing of the Internet cutoff in relation to Wikileaks’ release of the factious Goldman Sachs transcripts so dubious, we posited the move akin to flagrant state-sponsored censorship of the press. 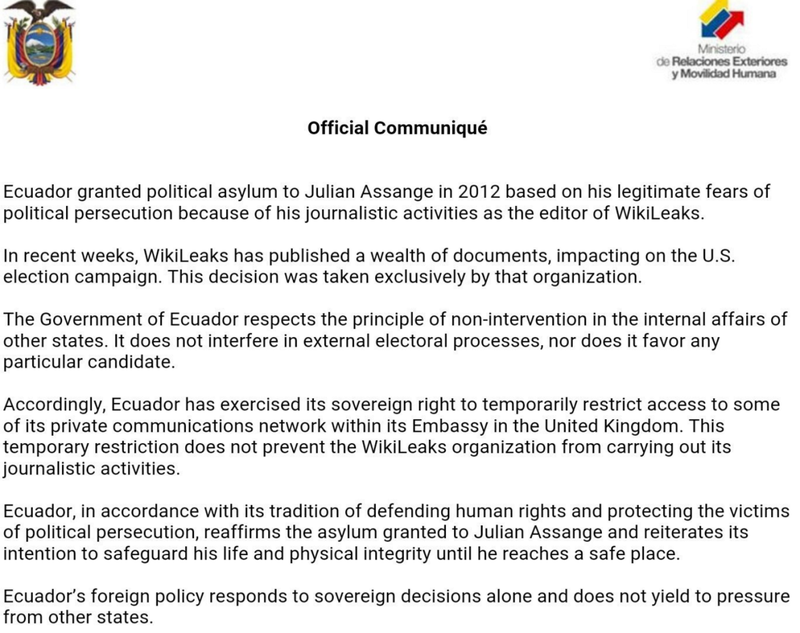 “Ecuador granted political asylum to Julian Assange in 2012 based on his legitimate fears of political persecution because of his journalistic activities as the editor of Wikileaks. “In recent weeks, Wikileaks has published a wealth of documents, impacting on the U.S. election campaign. This decision was taken exclusively by that organization. “The Government of Ecuador respects the principle of non-intervention in the internal affairs of other states. It does not interfere in external electoral process, nor does it favor any particular candidate. While that point did prove true — after the early morning statement from Wikileaks about Assange’s cut connection, another trove of documents from the Podesta files were released — the move still amounts to state censure for two reasons. For one, severing Assange’s Internet connection constitutes government punishment without his ability to either defend his position or refute Ecuador’s assumptions he intended to disrupt the election. Secondly, the fact Assange has no other viable means of communication with the world equates that abrupt removal of access with the blatant suppression of an authoritarian government writ large. 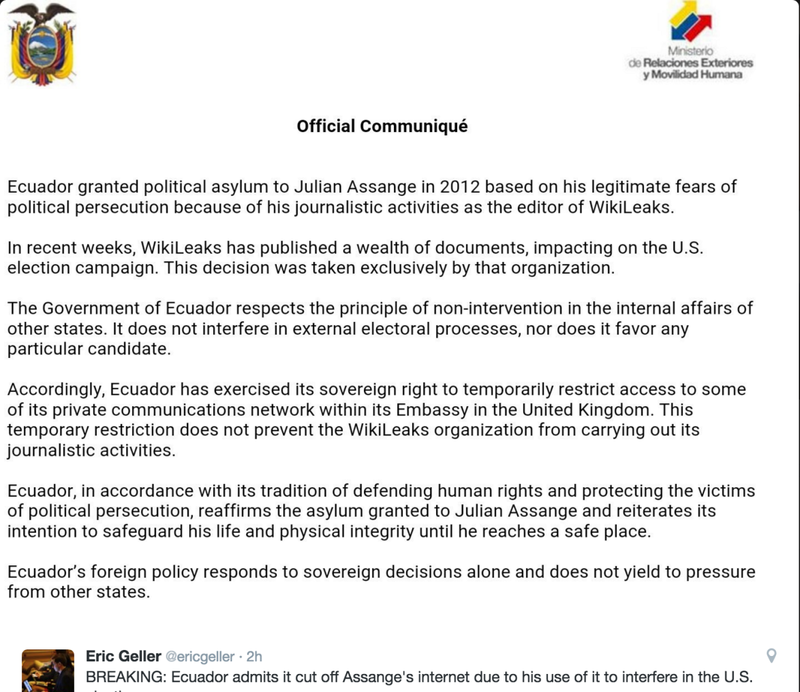 Additionally, in light of the Ecuadorian government’s previous assertion it would defend Assange’s press freedoms unconditionally, the sudden removal of his ability to communicate — coincident with the Secretary of State John Kerry’s ongoing negotiations in Ecuador and continued repercussions to the Clinton campaign from the October Surprise — would lend legitimacy to suspicions the U.S. government indeed played a more direct role in the decision than is being asserted. Although that last point may prove unfounded — or never come to light — it would appear freedom of the press and of speech have suffered a fortuitous and telling direct hit.